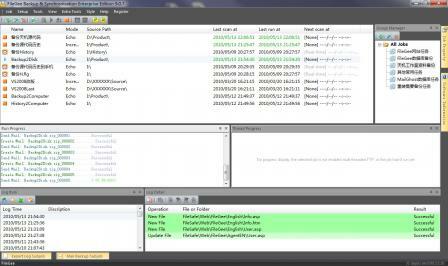 2.Can hot backup database files, can read the file locked by other programs. 3.Can work as windows Service, doesn't need log in the operating system, runs completely in the background. 4.FTP can multi-threads upload or download. 5.FTP can resume broken upload or download. 6.FTP has FXP, two FTP servers can transmit file directly. 7.FTP has SSL, enhances data's security and reliability. 8.With independent multi-job mode, the software can execute different backups or synchronizations for different file folders simultaneously. 9.Support one-way synchronization, bi-directional synchronization, incremental backup, full backup and other types of file synchronization and backup. 10.With various automatically triggered job modes, the software can start up backup and synchronization jobs in real-time, timing, interval, system idleness or manual methods. 11.USB removable storage devices can be monitored in real time, automatically backup or synchronize when the storage device plug in. 12.Support Unicode, the file name with multi-charset language can be processed. 13.Able to encrypt files when the backup or synchronize runs. 14.Intelligent recovery function for incremental backup, you can restore the source directory structure and files completely same as each execution. 15.Can adopt all-purpose zip format to compress backup files and can create password to protect the files. 16.Provide file filter function to execute selective filter or file name approximate matching filter for the targeted files. 17.Support to start job with command-line, you can run job in other software. 18.Support to run command-line before and after the job execution. 19.With plenty of timing planning solutions, the software supports monthly, weekly and daily planning modes.